As the elevator industry strove, over the centuries, to build and to service ever-higher structures, a corresponding goal was to make it possible to move materials and individuals between the surface and ever-deeper levels. The "Genesis of Lifting" Wing bore out that ore might have been more important than human welfare in the Copper, Bronze and Iron Ages. The watershed invention of, and improvements upon, the steam engine was by entrepreneurs attempting to make lower levels of mining more productive -- not moving goods or individuals above the surface. 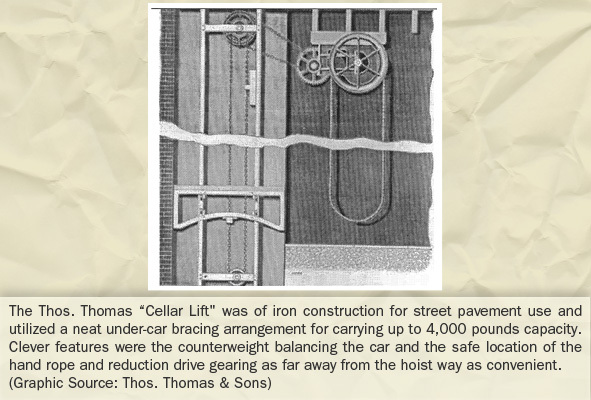 Inventors focused upon underground transportation also perfected the car safety, traction sheave and wire rope. Previous Galleries presented information concerning the growth of commerce within and between cities. As urban centers became more congested, and ground more expensive, commercial establishments were compelled to create more space for storage and equipment. Very often it was more economical, secure and efficient to dig out a basement than to add a story. And a cellar was closer to such city utilities as existed. Supplies could more easily be unloaded directly into basements than upper stories. This was the level that held fuel and furnace, residue ashes, cooled barrels of beer and the simple lifts that moved materials -- some better left unseen by customers -- from cellar to surface. Centuries later, the single cellar would give way to two or more sub-basements, service levels for high-rise buildings. 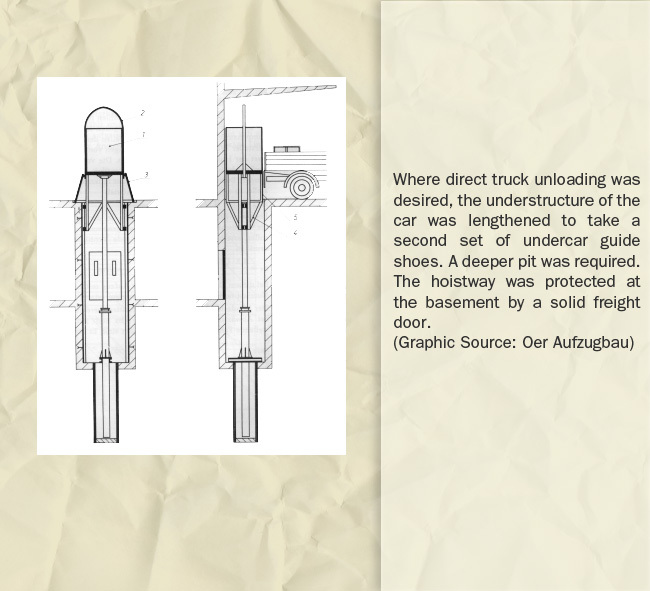 The most efficient of these lower levels received freight via heavy-duty truck elevators in a move to reduce off-street unloading. Plans to build the London "Underground" brought the realization that trains would discharge passengers in numbers previously not experienced -- one after another. Subway rail transportation had become efficient in moving masses of people; how could they be brought to the surface as fast? The elevator industry's moving stairway was the answer. As it was improved, the escalator became accepted as the sister piece of equipment to the underground railway. The depths were first plumbed in the mining activities of early man. Copper may have been available on the surface, but as other metals became important in the creation of tools and weapons, men were compelled to go deeper and deeper to find the ores so necessary for their new ways of life. 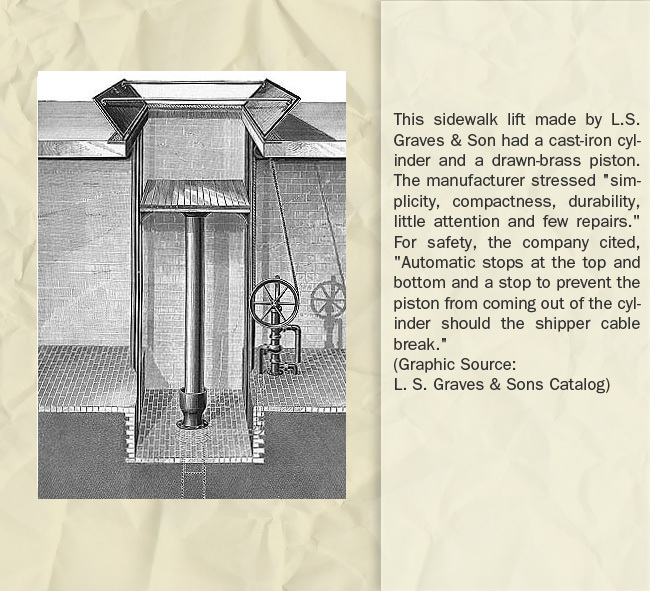 Ingenious pre-engineers thought far more about lifting under the ground than above it. 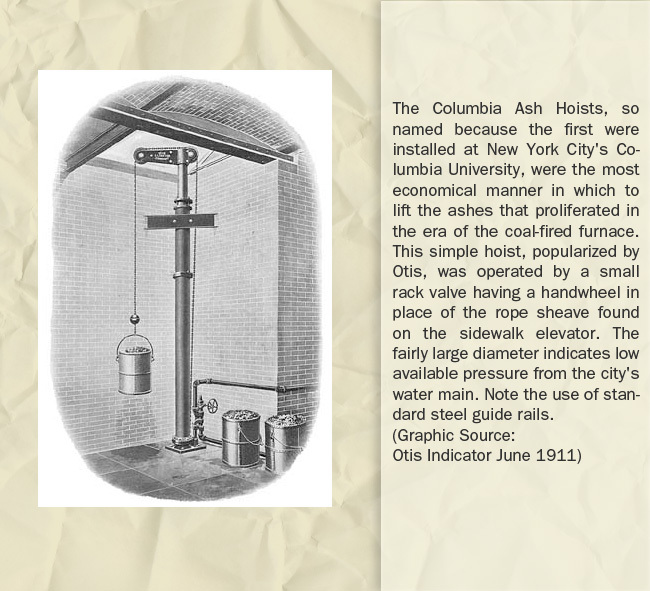 The steam engine was invented and improved as a means of pumping out the lowest mine levels and later to move the ore out and the miners up and down. 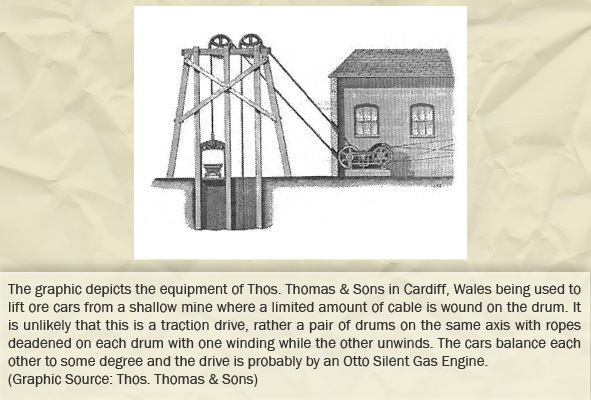 As human safety became a factor, the broken rope safety, stronger hoist rope and the traction sheave were accompaniments to the drive engine at the mine site. The combination was to find even more value when it was found expedient to move men and materials far shorter distances above ground. 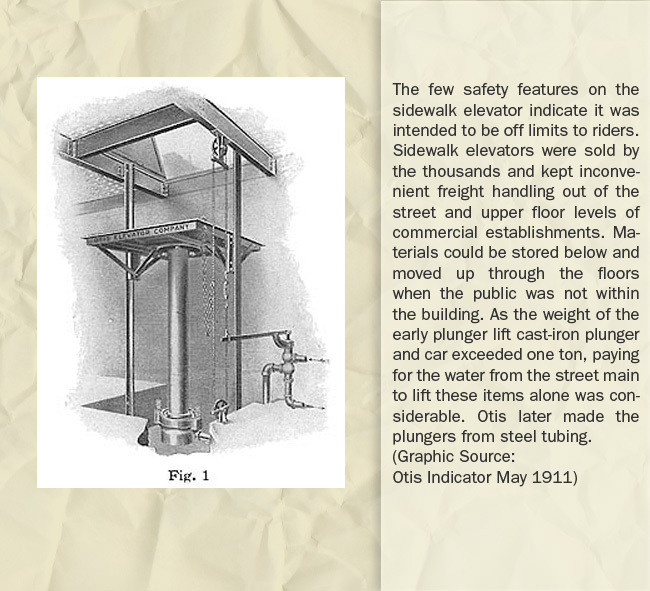 The hoist ropes, safeties and traction drives lifting passengers in the modern times were given birth below the ground! 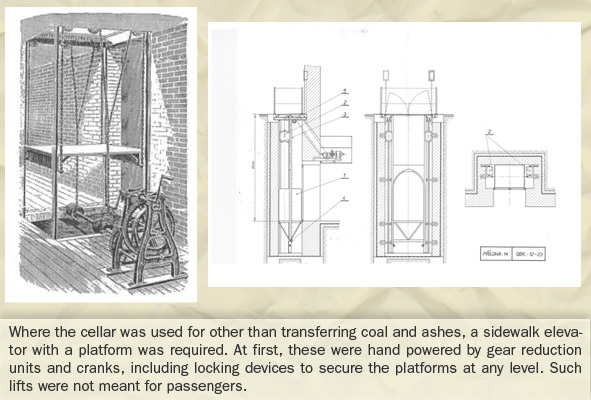 Why the proliferation of short-travel lifts in early commercial history? It was probably more economical to dig out a basement than erect an upper floor. Then, too, the basement became the machine room for the building. It houses the furnace and the coal as well as the residue ashes. 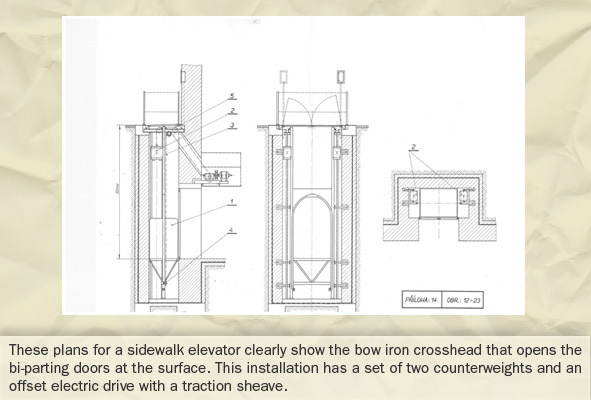 If the building was multistory and required a stem of hydraulic elevator, it was still handy to have a lift between the cellar and the sidewalk. 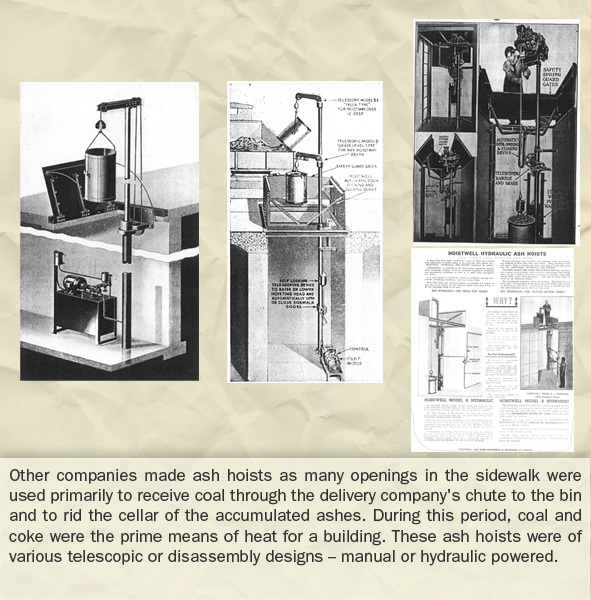 Manufacturer catalogs indicate that sidewalk elevators were big business in the early days of elevatoring. A basement kept unsightly necessities out of the customers' sight and a firm foundation for such machinery as the building required. It was a cool place to store kegs of beer and other perishables in times that knew little of refrigeration. 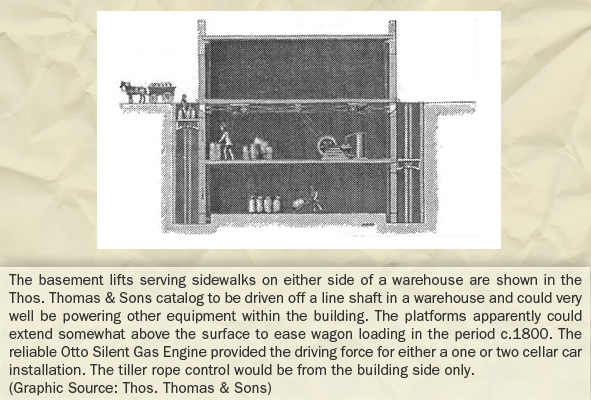 No substitute existed for the sidewalk lift that took merchandise or bulk materials directly to their storerooms. When the floor of the sidewalk lift could be raised to the level of the truck bed, that was the "frosting on the cake"! "Necessity is the mother of invention" was never more aptly applied than to the emergence of the moving stairway. The continuous conveyance of passengers by the elevator industry awaited the development of the underground railway that emptied hordes of passengers with the arrival of every train. The platforms had to be cleared for the next train's arrival. People poured into (and out of) the cores of the largest cities. They had to be quickly taken to the surface or, in the instance of the elevating railways, down to the street level. A number of entrepreneurs became engaged in a race to arrive at an obvious solution -- the continuous short-range conveyance of people. As in the elevator's exodus from the mines, once the initial problem was solved, the escalator sought other fields to conquer. The newly conceived and increasing popular innercity department stores were the next proving ground. If the merchandizing mart had a "bargain basement," the continuous conveyor found itself, once more of importance underground, moving passengers and their luggage longer distances, horizontally -- often beneath the wheels of aircraft, landing or taking off!